IHRC’s annual newsletter is now available for download and in hard copy format for physical distribution. Each newsletter comes with donation forms and we’d be so appreciative if you would please consider donating even a small regular amount to us on a monthly basis. IHRC works to raise awareness about human rights and to ensure that existing human rights laws are being properly enforced. Therefore whatever contribution you can make is most highly valued. Please take the time to fill in a form and return it to us at Islamic Human Rights Commission Trust PO Box 598, Wembley, HA9 7XH, United Kingdom. This year’s newsletter comes with an ominous opening as the strict policing of Muslims has only increased in the past months. IHRC is determined to defend the rights of all Muslims and resist the government’s attempts to turn the Muslim community into a pliant one. You’ll also be able to learn more about the work we’ve done at the United Nations and abroad with the Universal Justice Network; the work of IHRC Legal and our Advocacy department – working tirelessly and vigilantly, the Research department’s Hate Crime Project and so much more! 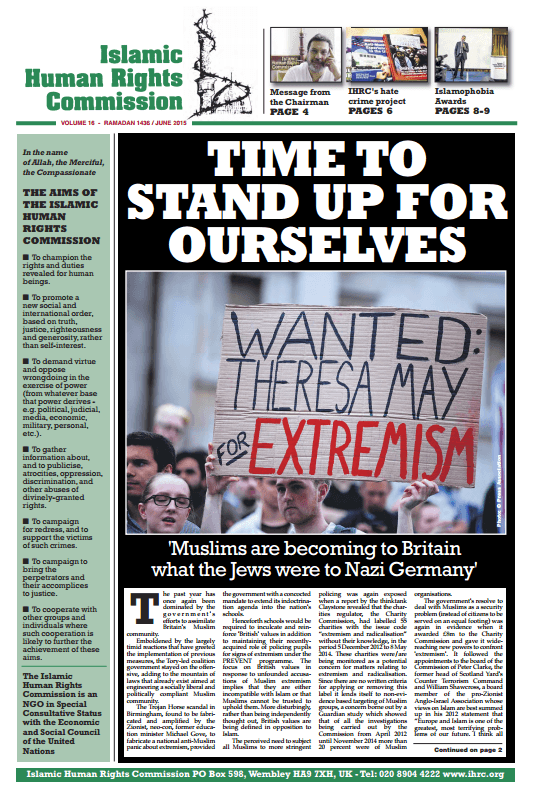 Please help us distribute the newsletter this year… for free copies for your family, friends and local mosque or Islamic centre, call the IHRC office on 0208 904 4222 or email: info@ihrc.org. And please also email links to this page to your contacts, and distribute through email lists, Facebook, etc.